My beloved associates in this great work, I never come into this Tabernacle without thinking of the devotion and sacrifice of our pioneer fathers who constructed it as a house of God. They dedicated and consecrated it to worship and the teaching of truth. A great and sacred trust is placed in us, as we occupy this pulpit, to speak words of faith. To that end I humbly seek the direction of the Holy Spirit. Mine has been the opportunity to meet many wonderful men and women in various parts of the world. A few of them have left an indelible impression upon me. One such was a naval officer from Asia, a brilliant young man who had been brought to the United States for advanced training. Some of his associates in the United States Navy, whose behavior had attracted him, shared with him at his request their religious beliefs. He was not a Christian, but he was interested. They told him of the Savior of the world, of Jesus born in Bethlehem, who gave his life for all mankind. They told him of the appearance of God, the Eternal Father, and the resurrected Lord to the boy Joseph Smith. They spoke of modern prophets. They taught him the gospel of the Master. The Spirit touched his heart, and he was baptized. His face clouded, and he replied, “My family will be disappointed. I suppose they will cast me out. They will regard me as dead. Yesterday the growth statistics of the Church were presented. They are impressive and gratifying. They called to mind a recent broadcast of one of the nation’s popular television programs in which Joe Garragiola interviewed the Reverend Dean M. Kelley of the National Council of Churches, who spoke of the declining membership of some of the larger, well-known religious bodies and also of the accelerating growth of others. He gave as the reason for the decline: “Because they have become permissive; they allow just anybody to become members or remain members. They don’t insist on any rigorous requirements of belief or of contributions.” He pointed out, on the other hand, that those groups which require sacrifice of time and effort and means are enjoying vigorous growth. This is a most striking commentary, and one that should concern every thoughtful man and woman. One thing that it says is that a religion which requires devotion, which asks for sacrifice, which demands discipline, also enjoys the loyalty of its membership and the interest and respect of others. It was ever thus. The Savior did not equivocate when he said to Nicodemus: “Except a man be born of the water and of the Spirit, he cannot enter into the kingdom of God.” (John 3:5.) There were no exceptions. There was no permissiveness in complying with the rule. It was so in other matters of which he spoke. Paul never hedged nor quibbled when setting forth the requirements of the gospel of Jesus Christ. It is so today. The Lord himself declared that “strait is the gate and narrow is the way.” Any system dealing with the eternal consequences of human behavior must set guidelines and adhere to them, and no system can long command the loyalties of men that does not expect of them certain measures of discipline, and particularly of self-discipline. The cost in comfort may be great. The sacrifice may be real. But this very demanding reality is the substance of which come character and strength and nobility. Permissiveness never produced greatness. Integrity, loyalty, strength are virtues whose sinews are developed through the struggles that go on within a man as he practices self-discipline under the demands of divinely spoken truth. But there is another side of the coin, without which this self-discipline is little more than an exercise. Discipline imposed for the sake of discipline is repressive. It is not in the spirit of the gospel of Jesus Christ. It is usually enforced by fear, and its results are negative. But that which is positive, which comes of personal conviction, builds and lifts and strengthens in a marvelous manner. 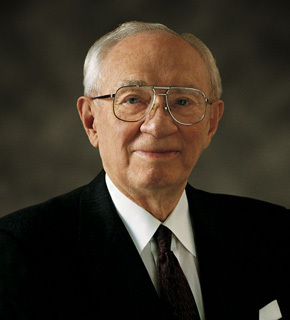 In matters of religion, when a man is motivated by great and powerful convictions of truth, then he disciplines himself, not because of demands made upon him by the Church but because of the knowledge within his heart that God lives; that he is a child of God with an eternal and limitless potential; that there is joy in service and satisfaction in laboring in a great cause. The remarkable progress of this church, to which the Reverend Kelley referred, is not so much the result of the requirements of the Church upon its members as it is the result of the conviction in the hearts of those members that this is in very deed the work of God, and that happiness and peace and satisfaction are found in righteous service. The yoke of Church responsibility, the burden of Church leadership become opportunities rather than problems to him who wears the mantle of dedicated membership in the church of Jesus Christ. “It’s true,” he said to himself again and again. “It’s true.” A peace came into his heart. As he walked toward home, the restrictions, the demands, the requirements over which he had been so incensed began to appear as opportunities. When he opened the door, he found his wife had been on her knees. Then, before the congregation to whom he told this, he spoke of the gladness that had come into their lives. Tithing was not a problem. The sharing of their substance with God who had given them everything seemed little enough. Time for service was not a problem. This required only a little careful budgeting of the hours of the week. Responsibility was not a problem. Out of it came growth and a new outlook on life. And then this man of intellect and training, this engineer accustomed to dealing with the facts of the physical world in which we live, bore solemn testimony with moistened eyes of the miracle that had come into his life. So it is with hundreds of thousands in many lands—men and women of capacity and training, of business and the professions, hardheaded, practical men who do things in the work of the world, in whose hearts there burns a silent witness that God lives, that Jesus is the Christ, that this work is divine, that it was restored to earth for the blessing of all who will partake of its opportunities. Jesus, speaking to the Jews in the temple, said: “My doctrine is not mine, but his that sent me. Each man may know for himself that it is true through the gift of the Holy Spirit, and with as certain an assurance as that the sun will rise in the morning. And knowing that it is true, he will be inclined to discipline himself as becomes one who has a knowledge of the meaning and purpose of life, of his great responsibility to his fellowmen, of his responsibility to his family, of his responsibility to God. “More than anything else in the world, I wanted to serve God. But try as I might, I could not find him. The miracle of it all is that he found me. One Saturday afternoon in September 1969 I was at home in Berkeley, California, and heard my doorbell ring. There were two young men there, dressed in suits, with white shirts and ties. Their hair was neatly combed. I was so impressed with them that I said: ‘I don’t know what you’re selling, but I’ll buy it.’ One of the young men said: ‘We aren’t selling anything. We’re missionaries of The Church of Jesus Christ of Latter-day Saints, and we would like to talk with you.’ I invited them to come in, and they spoke about their faith. “When Jesus came into the coasts of Caesarea Philippi, he asked his disciples, … whom say ye that I am? “And Jesus answered and said unto him, Blessed art thou, Simon Barjona: for flesh and blood hath not revealed it unto thee, but my Father which is in heaven. This rock of revelation is the source of knowledge concerning the things of God. It is the witness of the Holy Spirit that testifies of eternal truth, and the gates of hell shall not prevail against any man who seeks it, who accepts it, who cultivates it, and who lives by it. Of these sacred things I offer my solemn testimony and invoke the blessings of this knowledge upon all earnest seekers after truth, in the name of the author of truth, even the Lord Jesus Christ. Amen.